The Simply Light Designs Sunset Saddle Bags are simple storage pockets that attach to the peaks of a hammock, but hang below, taking advantage of the open space. The triangular-shaped nylon bag has a mesh top that has zippers on both sides allowing for easy access. A single mini carabiner clips to the hammock suspension on the top, and D-rings on both sides attach to quilt hooks (pack hooks) or grip the side of the hammock with alligator clips. Extra shock cord, mitten hooks, and binders are included to adapt to any hammock. Hammock storage is a unique conundrum. Tent have vestibules, and tarps are just one big vestibule, but hammocks float above the ground, so where do you put your gear? On one hand, you have TONS of space under a hammock tarp (one HUGE vestibule), but access and organization can sometimes be a pain. I love how hammocks allow for stand-up access, and keeping gear off the ground is ideal for me, so I like how the Sunset Saddle Bags allow this access. 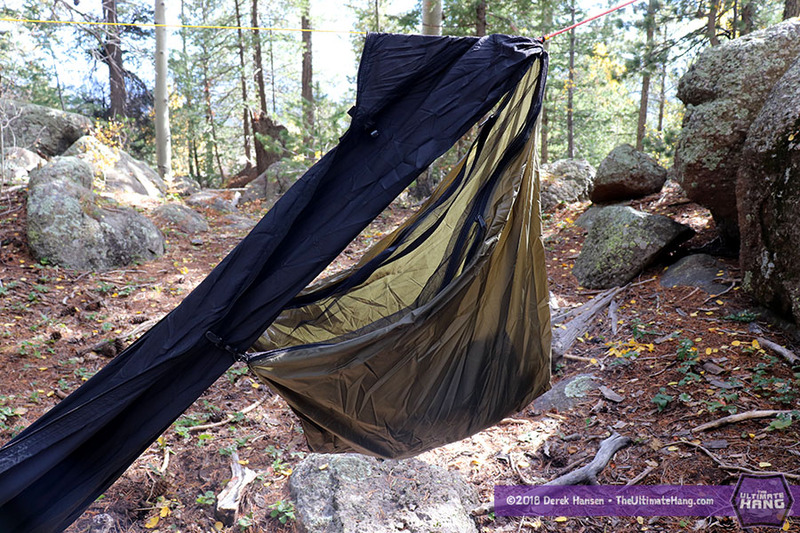 Better than gear hammocks in my opinion, these bags don’t jar the hammock occupant or conflict with insulation options. I typically hang my backpack off the end of my hammock to keep it off the ground and protected under a tarp, but access gear inside can sometimes be a struggle. Having the mesh opening of the Saddle Bags makes it easy to see the contents and the long zippers provide easy access. You get two (2) storage bags with one purchase, but I have found that I only really need one in practice.These saddle bags, like other hammock accessories, are luxury items, no question. They can certainly make a trip more enjoyable and functional, especially multi-day base camps (summer camp anyone?). I’ve sure enjoyed using them. Alligator clips—The are designed to clip directly onto hammock quilt hooks. If your hammock comes with those already, you’re in luck (Dream Hammocks, DutchWare, and others). If not, the included alligator clips, mitten hooks, and shock cord are useful for clipping directly to the hammock. Most of my hammocks don’t have quilt hooks, or have them in the right spot, so I used the alligator clips. I found that I didn’t need the shock cord, so I took the alligator clips and connected them directly to the mitten hooks which clipped to the Saddle Bag’s D-rings. I folded the fabric and made a direct connection to keep the Saddle Bags in the right position. Mini Biner—The included mini biner makes it easy to clip the peak of the Saddle Bag to the hammock suspension, but for a more permanent (and gram-weenie lighter) solution, I removed the biner and slipped the loop on the end over my suspension, tucked under the ridgeline for more security. Suspension and Anchor System ★★★★★ The bags come complete with all necessary hardware and accessories to adapt to any hammock. Construction and Craftsmanship ★★★★★ High-quality cottage make. Modularity ★★★☆☆ The design can adapt to any range of hammocks, even those without quilt hooks or ridge lines. Aesthetics ★★★★☆ A few color options are available when ordering. Price and Value ★★★☆☆ Although you get two (2) bags, the price seems a little high for what amounts to simple stuff sacks with clips. The designs ingenious and innovative. I have one of the sunset saddle bags and it is a great idea.